Data-driven decisions are the best decisions. Web analytics provide mounds of data about your visitors. Proper measurement allows you to better understand traffic source and campaign performance to optimally allocate marketing budgets. Data segmentation allows you to eliminate or retool under-performing traffic segments while diverting budgets to areas where you’re most successful. We’ll help you better understand the customer journey through analytics, providing valuable insights to improve your decision marketing. Web analytics provide mounds of data about your visitors. Proper measurement allows you to better understand traffic source and campaign performance to optimally allocate marketing budgets. Data segmenting allows you to eliminate or retool under-performing traffic segments while diverting budgets to areas where you’re most successful. Optimizing the online conversion funnel lifts performance across all website visitors. By identifying weak conversion areas, developing alternatives, and executing performance tests, conversion performance improves and ultimately increases the ROI on every inbound channel. Whether it’s about budget allocations and conversion rates or user experience and better understanding the customer journey, analytics can provide valuable insights to improve your decision marketing. Website improvements start with an effective plan. We take a comprehensive look at the current data available, provide insights, and recommend additional tracking strategies that would help improve data quality and effectiveness. Then, we identify areas of improvement on the customer journey so you can make the most of your performance testing and conversion improvement efforts. Audits range in complexity from a simple look at a conversion tracking setup to lifetime customer values and microconversion analysis tied to client CRM’s. Whether you’re looking for quick wins on how to increase conversion rates, or want to develop complex remarketing lists, we can take your questions and problems and find solutions. We work with our clients to understand their goals, then define success metrics based on these goals to maximize the effectiveness of the solutions we recommend. Depending on the nature of our client’s business, simple online sales measurement alone may be insufficient to determine campaign values. We strive to encompass total value gains be recognizing intermediate purchase steps and assigning value to user engagement when appropriate. When evaluating the performance of online marketing campaigns, how success is defined can greatly influences the results. We work with our clients to determine and measure accurate success indicators. This enables the marketing team to optimize campaigns appropriately to maximize their true effectiveness. 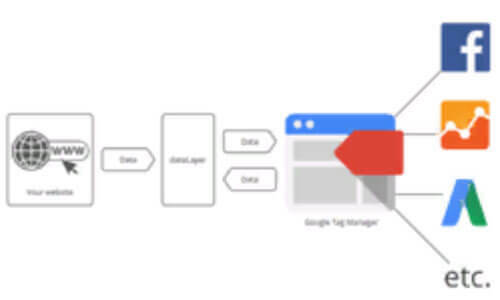 Google Tag Manager is a script manager by Google, allowing marketers and website owners to make script changes to a website without editing website code or relying on a developer for changes. GTM’s flexibility has made it our primary method of implementing tracking for clients. We execute migrations from standard Google Analytics tracking to GTM and are experts at using advanced methods to extract useful data. Whether we are implementing a full tracking program for your website, or you already have GTM in place and would like assistance making the most of it, our experts can help you use it to its full potential. Once we’ve developed a tracking plan and settled on a way to execute it, we help clients maintain their data collection strategy through standardized tagging and monitoring. This allows us to quickly and easily filter performance data to provide clear, actionable solutions based on the data collected. This is typically done via a Google Spreadsheet Document, or Excel, depending on the complexity and functionality needed. Tracking instructions on this document then correspond to data collected via analytics software or client CRM’s. We provide ongoing performance testing services in an effort to improve conversion rates and website performance. Through statistical a/b and multivariable testing, we compare the performance of different approaches to discover which tactics resonate best with visitors and lead to the highest ROI. For more information, please visit our CRO services. Our analytics audits provide in-depth insight into website usability and performance issues, providing designs and marketers with actionable advice to enhance performance. Tracking projects are designed to collect useful data in an actionable way. These approaches allow us to set up baselines and track KPI’s so make reporting straight-forward and useful for marketers. Our goal is to provide you with information vital to making positive changes and measuring the effectiveness of those changes. While we frequently create custom reports and use client CRM’s to make the most of our data, our standard tracking is done via Google Data Studio. Using multiple data sources including Google Analytics, this platform allows us to provide custom reports in real-time displaying meaningful metrics for clients.